Olympic gymnast Dan Purvis has been given a surprise send off ahead of the Commonwealth Games in Australia. 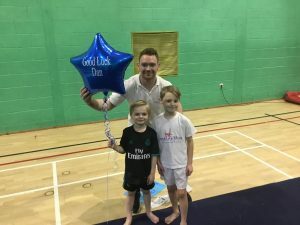 The Crosby gymnast has flown out to the Gold Coast to represent Scotland in the Games but before he left, Dan was surprised at Dunes Leisure Centre, Southport with a special cake and balloon to wish him all the best. Many of the children who Dan, 27, coaches across Sefton were on hand to join Active Sefton staff in presenting him with the gifts. Dan has since travelled to Australia along with his fellow gymnast Frank Baines, with the duo both representing Scotland at the Commonwealth Games between April 4 and April 15. Heather Redhead, Sefton Council’s Health and Wellbeing Development Manager, said “It was so nice to be able to surprise Dan and Frank ahead of the Games. “Dan was presented with a cake and balloon by the youngsters he coaches at Dunes Leisure Centre, as they wanted to wish him well and say good luck ahead of the Games. “The Dan Purvis Gymnastics sessions, which operate at both Netherton Activity Centre and Dunes leisure Centre. are incredibly popular and both Dan and Frank give up their time to help encourage a whole new generation of gymnasts. “Dan is also a strong advocate of Active Sefton’s programmes and has been very supportive of Sefton’s own ‘Jump into Gymnastics’ sessions. To find out more about Active Sefton’s Jump Into Gymnastics sessions, call 0151 288 6283. Active Sefton is proud to announce the launch of Sefton Park Nights. The Easter evening events are a new scheme designed to give youngsters across the south of borough the chance to enjoy a host of free and fun activities. Throughout the fortnight (Monday March 26 – Thursday April 5) youngsters can take part in a raft of free activities including street golf, zorb football, climbing walls and more! Park Nights is organised by Active Sefton and funded by the Merseyside Police Community Cash Back Fund. Heather Redhead, Sefton Council’s Health and Wellbeing Development Manager , said: “We are delighted to be able to launch Park Nights after huge successes with other events in the past such as Sefton Lights. For more information contact the Active Sefton Team on 0151 288 6286. The opportunity to join Sefton’s sporting hall of fame is one step closer as entries open for 2018’s Sefton Sports Awards. Now in its 16th year, the awards celebrate the very best of the sporting offer across the borough with categories celebrating the outstanding talent and commitment of local athletes, coaches, volunteers, clubs and schools. 2018 is already a sporting year to remember with the Winter Olympics and Paralympic games, Commonwealth Games and the World Cup all on the agenda. This makes it the perfect year to truly celebrate what is on offer in Sefton and recognise the people who make it all possible. Especially poignant this year are the two awards celebrating sporting volunteers, given that 2018 is Sefton’s Year of the Volunteer. Volunteers can be nominated in the Volunteer of the Year category and Young Volunteer of the Year. Taking place at Southport Theatre and Convention Centre on Wednesday, July 11, the event is organised by Active Sefton which is part of Sefton Council’s Health and Wellbeing portfolio. With 10 awards up for grabs there is a category to recognise all aspects of sporting achievements from school teams to top coaches and even a sports personality of the year. Tina Pilkington, Sefton Council’s Health and Wellbeing Development Manager, said: “The Sefton Sports Awards is one of my favourite events of the year and a fantastic opportunity for those involved with sports across the borough to be recognised for their efforts. Nominations can be made at sefton.gov.uk/seftonsportsawards. The deadline for entries is June 8, 2018. Be Active’s ‘wave rave’ pool parties entertained hundreds of Sefton’s young people and families during February half term. 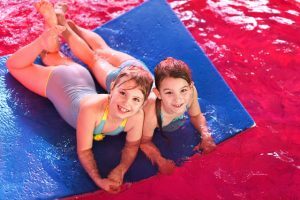 The wave raves are part of the new swim offer heading to Sefton that will see a major revamp of pool time-tables, the sessions on offer and vast improvements to changing facilities at Dunes Splash World, Southport and Meadows Leisure Centre, Maghull. More than 250 people from across Sefton enjoyed coloured pools, disco lights, music, floats and water cannons at Bootle Leisure Centre (BLC), Meadows Leisure Centre and Dunes Splash World. As a result of the huge success, the wave raves will be made a regular event across the three centres with those interested invited to book a place in advance to avoid disappointment. Brand new lighting and sound systems installed across the three centres have paved the way for a new era of pool based activities including wave raves, calm waters and a variety of sessions suited to all ages and abilities. Cllr Ian Moncur, Sefton Council’s Cabinet Member for Health and Wellbeing, said: “We have been blown away by the success of the wave raves with pools reaching capacity at BLC and Meadows! Rave reviews of the parties have been sent back to the organisers. One happy resident said: “I would just like to say thanks again for the two brilliant wave rave pool sessions that my family experienced. There are more rave waves planned in Be Active’s Easter half term line-up. Call the Active sports team on 0151 934 4799 for more information or to book you place. In addition, wave raves will take place on the last Friday of every month at BLC and Meadows. Contact the centres for more information or to book a place at the next session. Sefton’s pools are set to launch brand new swimming timetables complete with a selection of new sessions on March 1 2018. Dunes Splash World in Southport, Bootle Leisure Centre and Meadows Leisure Centre in Maghull will be introducing a variety of new swim sessions that have been specifically designed to match the feedback residents gave in a consultation last year. This comes as part of Sefton Council’s measures to improve the swimming offer in the borough made possible by grant funding from Sport England. The installation of high tech sound systems and lighting at the three centres has opened up a world of opportunities for the kind of pool sessions that can be offered in Sefton. Calm Waters will make use of mood lighting and gentle music to create a relaxed pool environment, perfect for those recovering from ill health or anyone who wants to enjoy a swim in calmer waters. Swim and Splash on the other hand will be perfect for younger swimmers looking to have fun in the pool. These sessions will come complete with music, floats and monthly Wave Raves will even see the pool dyed different colours. Swimming is a great form of exercise and the new swim fit sessions will allow participants to train in a lane that is relevant to their ability. They will have to option to follow exercises led by an instructor or through poolside swim fit cards. As well as the new additions, popular sessions are set to return including £1 swims, swimming lessons and Get Healthy Get Active, a swimming confidence programme for adults with learning disabilities and over 65’s. Over 3,000 people took part in the consultation to tell the council what they thought about swimming and how it could be improved. As well as tailoring new timetables, the consultation also led to a full renovation of the changing facilities at Dunes Splash World and Bootle Leisure Centre. All three centres will also be fitted with poolside lockers that can be used to store items such as glasses, hearing aids and walking sticks while poolside hangers can be used to hang towels and robes. Cllr Ian Moncur, Sefton Council’s Cabinet Member for Health and Wellbeing, said: “A lot of hard work has gone into improving the swim offer in Sefton and it’s fantastic to see everything come together.